Seriously though, there is something very precious about the little 'princesses' getting dressed up and going out with their daddy's. This is Laila's FIRST attempt at dress-ups. She has Maddie's Illini skirt over her head. This was funny...Grayson was LOVing having mittens on. He wore them all afternoon. Indeed-when there are Reese Puffs in the house...she won't eat any other cereal. I have to take her to the cereal cabinet and SHOW her when they are gone. 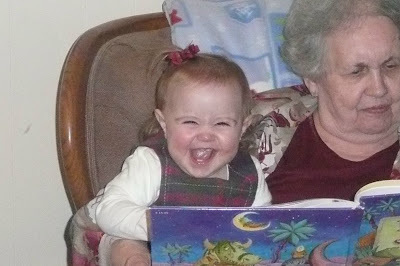 Grandma reading to the wiggle wormers...Grayson REALLY likes to read. Who are the twins here?